Our friend Heather Nichols, who runs Kid’s Directory of Northwest Arkansas, gave us a sneak peek into the amazing transformation her backyard has undergone this spring. 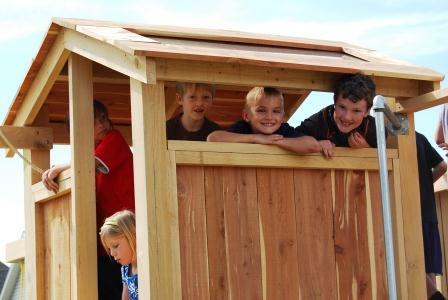 Where there was once an old swing set with exposed nail-heads and warping wood, there is now a brand new HUGE custom-built play structure, designed and constructed by Natural State Treehouses. As you can see from the swarm of kids in the photo above, the transformation has made the Nichols’ backyard THE place to be this spring. Here’s an outline of this unique project, in the words of the designer and builder, Josh Hart. The Mission: Design and build a play structure big enough to accommodate a TON of kids from the neighborhood who often play in the Nichols’ backyard. The Challenge: The play structure needs to appeal to a wide range of ages and it’s got to be incredibly strong and durable because of the heavy use it will get. The Requests: The Nichols’ kids tell me they want to climb. They want monkey bars, a fireman’s pole and possibly a rope-climbing activity. Check, check and check. We’ll work all of it into the plan. The Bells & Whistles: The Nichols want a space that’s big enough for impromptu camp-outs when the weather is nice. The Design: It begins with a 4-by-4 foot “kid-sized” clubhouse complete with enclosed walls and a skylight. It’s going to be a cozy play space with a great view of the clouds or stars. It’ll have an attached 6-by-4 foot deck platform that’s big enough for lots of kids to play or even a few grown-ups to stretch out in sleeping bags. We’re putting in several entrance and exit points so that kids can play at the same time without creating a bottleneck, and we’re using the slide, fireman’s pole, monkey bars, and climbing ropes to provide those traffic routes, in addition to an over-sized ladder that can handle two children climbing at once. To make the structure look and feel balanced, we’re offsetting the monkey bars on the east side with a run of swings on the west side — a traditional swing and rings from the old structure supplemented with a disk swing. 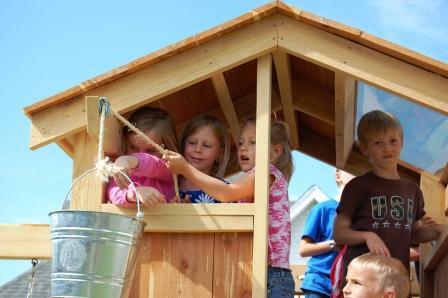 And of course, we’re including the classic bucket and pulley because no treehouse or clubhouse is complete without it. The kids are gonna LOVE it. The Materials: Oversized posts, beams and hardware for the construction to ensure added strength and safety. We’ll need 13 posts and about one ton of steel reinforced concrete. Even with 30 neighborhood kids playing on it at once, this thing is going to feel SOLID and completely secure. The Timeline: The 24′ x 8′ structure took five working days to complete, with a three-day weather delay for rain in the middle of the schedule. From our first brainstorming session to sweeping out the finished structure was approximately 2 weeks. The Results: The play structure is so popular with the neighborhood kids that we’re actually coming back next week to install a set of ladders so that the next-door neighbors can climb over the fence to come play. 🙂 And, because the family is so pleased with the quality and craftsmanship of the work, we’re also working on an addition to their deck and providing some bench seating around the family’s fire pit. The Perks: By far, the best part about this project was getting to know Heather, John and the Nichols children. They were fun, so hospitable and had really great ideas about the design. The kids really challenged me to create a design that could keep up with their amazing energy. And on the last day of the project when the kids got to play on the structure, their joy reminded me that I have the best job in the world. Mission accomplished. 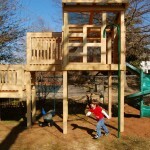 Note from the mamas: What we love about these custom-built play structures from Natural State Treehouses is how individual families are able to get exactly what they need for their kids’ ages and stages and it’s all customized for YOUR specific space. If you’d like to talk to Josh about your backyard wish list, call him at 479- 387-0701 or click HERE to see more examples of his work. 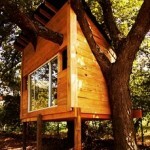 You can also email him at josh@naturalstatetreehouses.com or find him on Facebook and also on Pinterest. 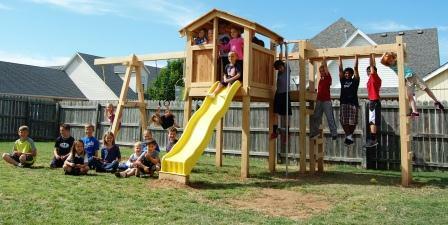 Now here’s a review of this play structure from the customers themselves — the kids! Heather interviewed the kids after the new play structure was revealed to find out what they think of the new place to play. Click the “play” arrow on the video below to watch. 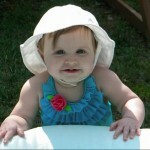 Picture Mama: Cute kids in Northwest Arkansas! 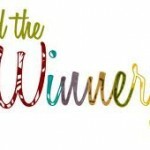 2012 Mom’s Choice Award Winners Announced! Honor your mom with a Mother’s Day message! 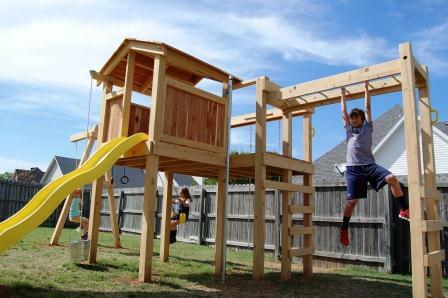 Thank you Natural State Treehouses for the fantastic play structure!! My kiddos and the neighborhood kiddos are thrilled! Thank you mamas at nwamotherlode.com for the fun feature. We love the mamas!